Neil Hadaegh Dentistry is not just any general dentist office; it is a general dentist competing in Beverly Hills. With a discriminating local demographic that already expects nothing but the best from dental care providers, we welcomed the challenge to create a custom general dentist website that stands head and shoulders above the rest. Beverly Hills is a city that is very sleek and sophisticated. We opted for a dark color scheme with a black background that complements the nighttime shots of Los Angeles that are exhibited on the website. When used tastefully, a dark, black color scheme is both classy and timeless – much like Beverly Hills itself. This is a highly visual website with many modern design elements. Most notably, visitors will notice the scrolling header images on the home page that fade one into another. These pictures show off shots of Beverly Hills, helping locals and out-of-towners alike learn what to expect from a visit to this office. Scrolling patient reviews catch the eye of site visitors, and a link to the practice blog helps give the practice a more personable and friendly reputation. This practice sees both locals and out of town patients. For that reason, we made it easy to schedule an appointment directly from the home page using a simple button. Online general dentistry marketing is never complete without social media. We implemented multiple links to the practice social media accounts both from the top and bottom of the homepage. Next, a before-and-after photos area reveals the types of results patients may achieve by undergoing treatment at this office. Finally, a special out-of-towners area of the website highlights the unique fly-in services offers to cosmetic dental patients who visit from outside southern California. For this Beverly Hills practice, the entire website emphasizes the importance of keeping and maintaining appearances. 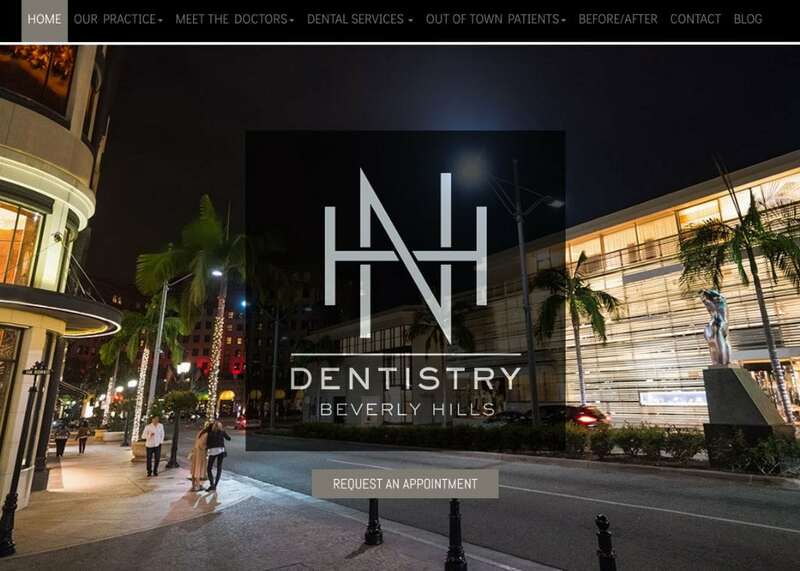 Pictures of Beverly Hills, L.A., Dr. Hadaegh, and the beautiful, smiling faces of people represent the practice on the homepage. It is an image that is consistent with the types of services offered by this general, cosmetic, and restorative dental practice.